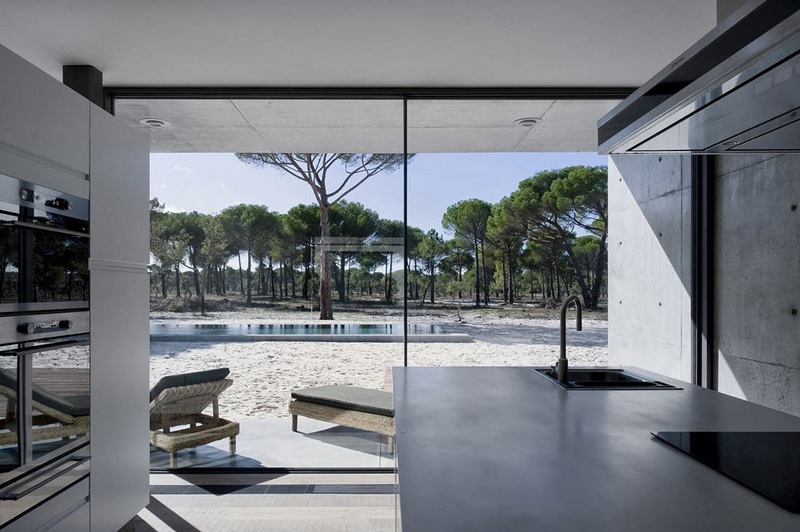 Lisbon based architects RRJ Arquitectos recently completed this minimalist concrete house in Comporta, Grândola, Portugal. 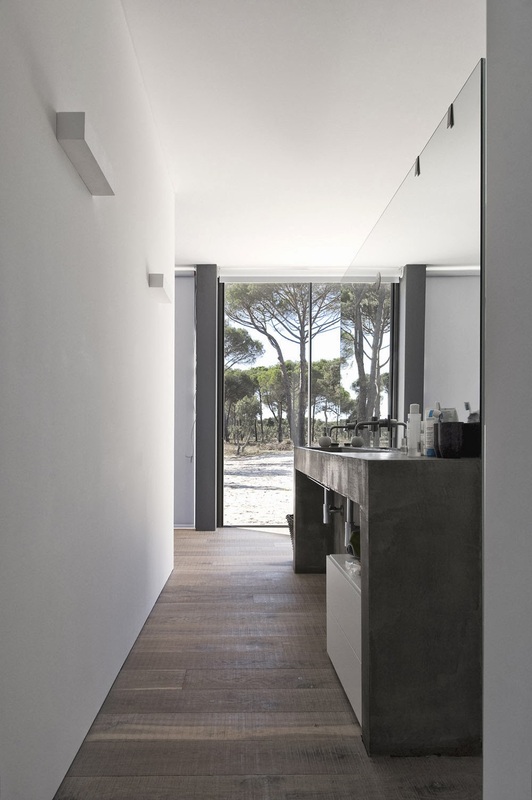 A composition of two volumes with totally pure, clean lines and restricted materiality characterize the building and its interiors. 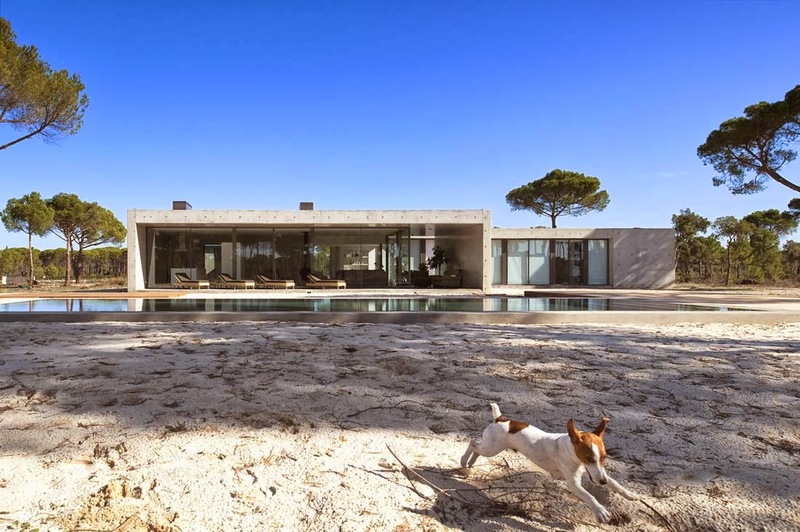 The house is on a large estate located in Comporta, Portugal. 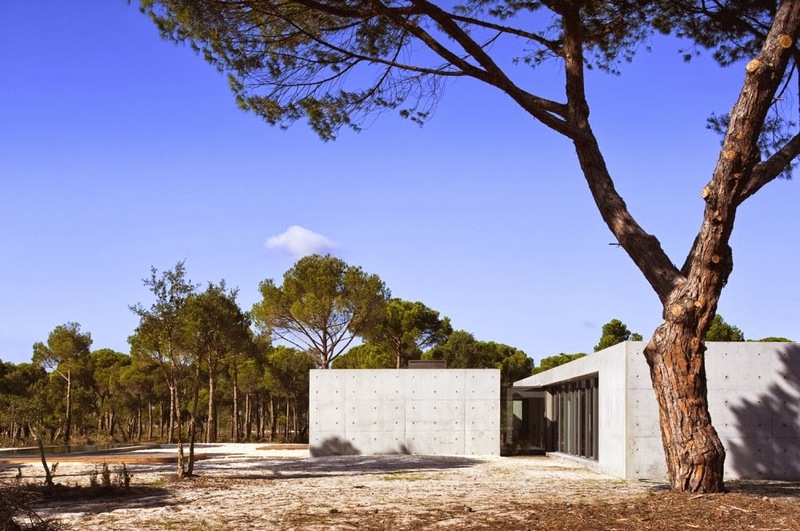 The site is completely clear, defined only by sandy soil, with spontaneous undergrowth vegetation and heavily punctuated by the vertical lines of many pines. 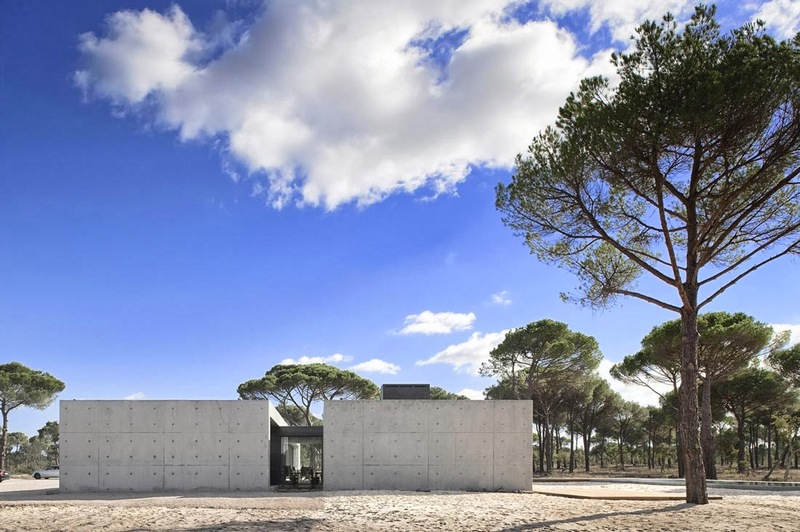 Against this backdrop, the main objective of architect Rui Pinto Gonçalves, from RRJ Arhitects, was to design a piece that would fit perfectly into the site. To register the landscape in a gesture, without highlighting it. 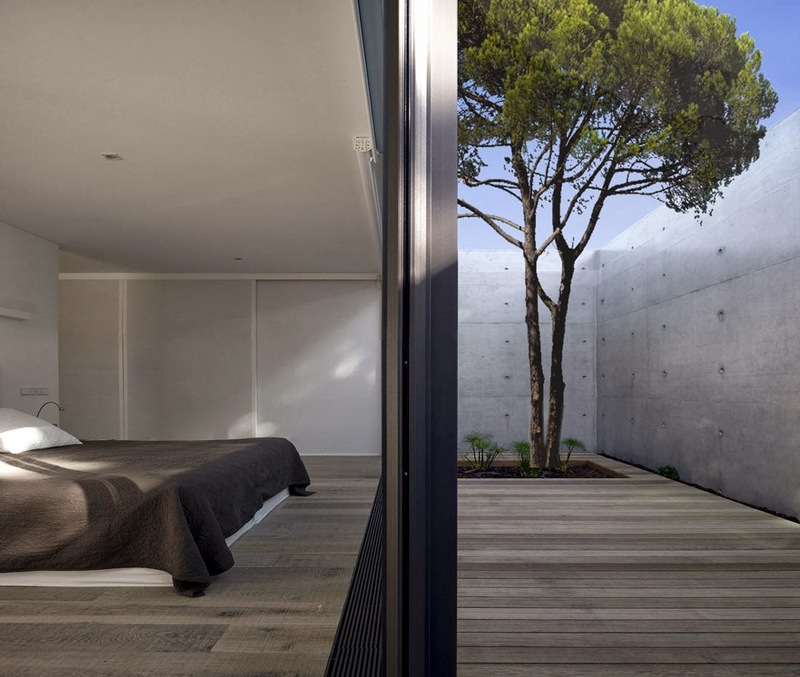 Merging the architectural object with the profile of the existing nature. 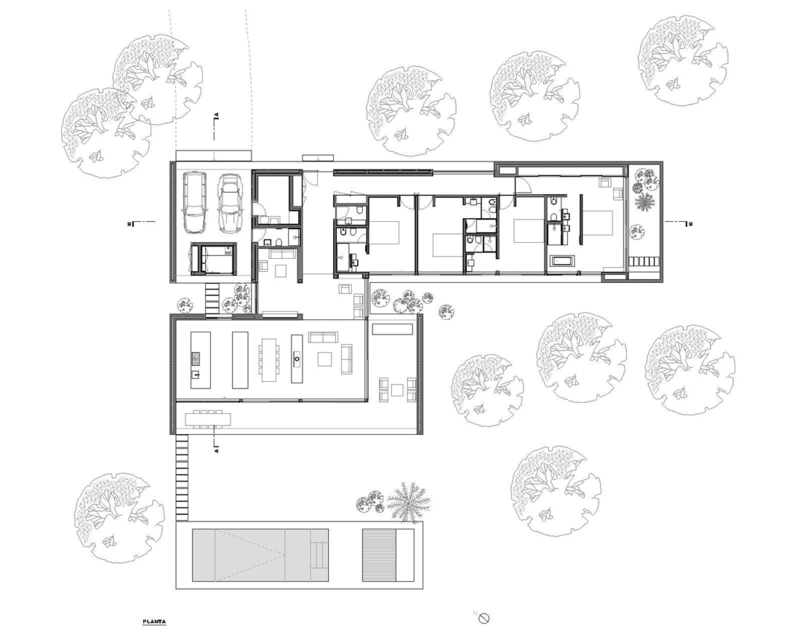 Following these premises, the conceptual process resulted in the composition of two volumes, interconnected by a smaller volume. 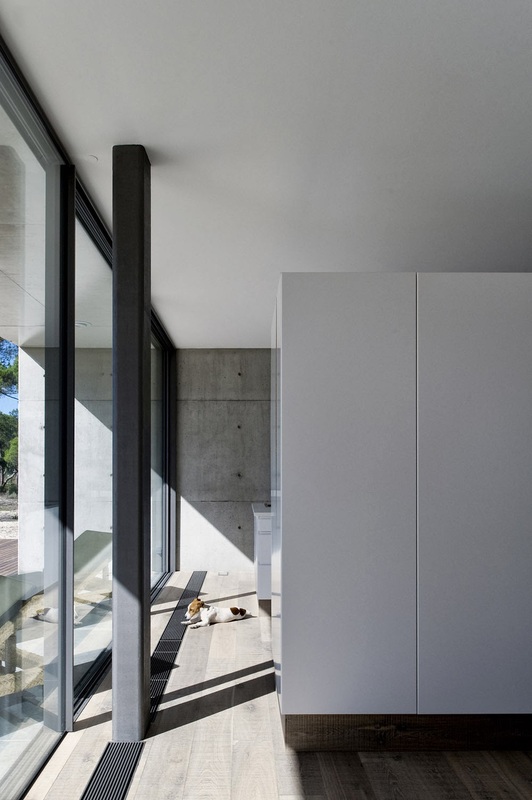 Two cast volumes, leaving the exterior circulate inside and that dilute each other. 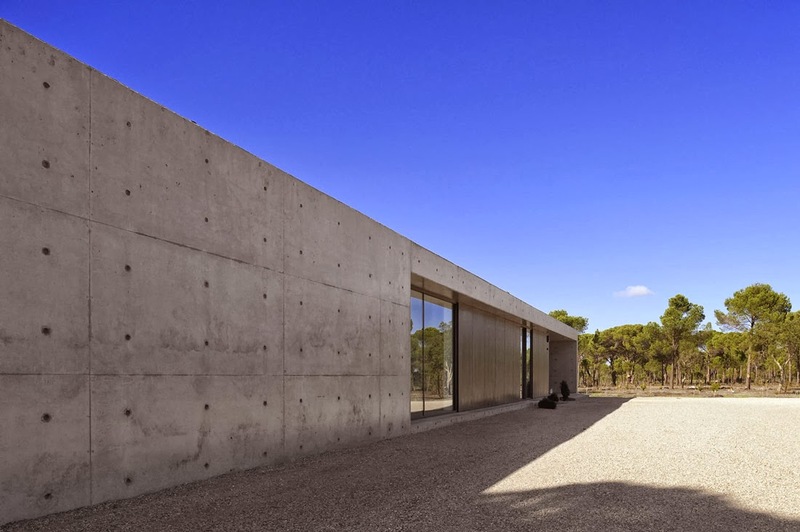 The project is set on the ground, as if it was part of it, horizontal and mimetic, by its scale, materials and colors, in parts of geometrical rigor, opening windows to the environment and simultaneously disseminating its own perspectives on its reflections. 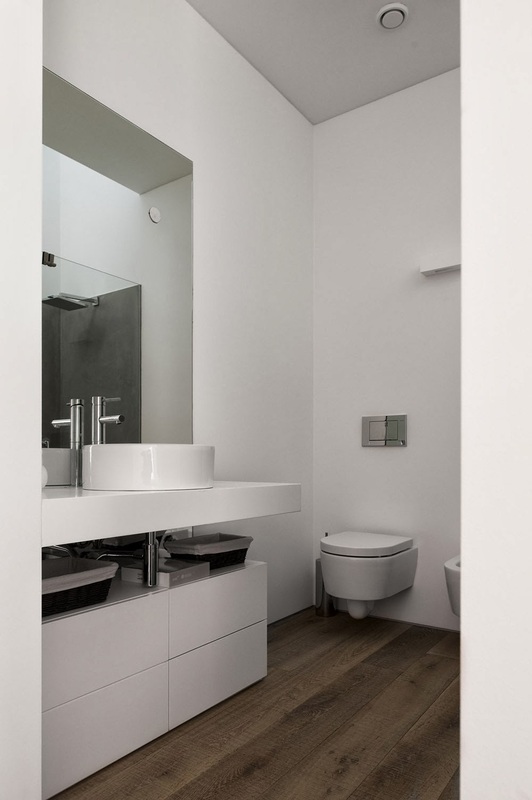 Contemporary language marks the entirety of the building, designed with clean lines and minimalist plays of planes and materials. 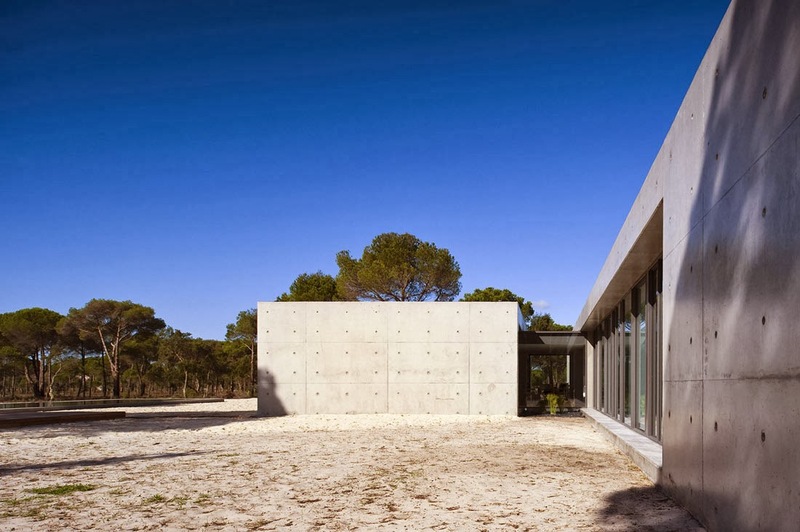 The main volumes are two exposed concrete parallelepipeds, fundamentally bounded by a minimum gray frame. 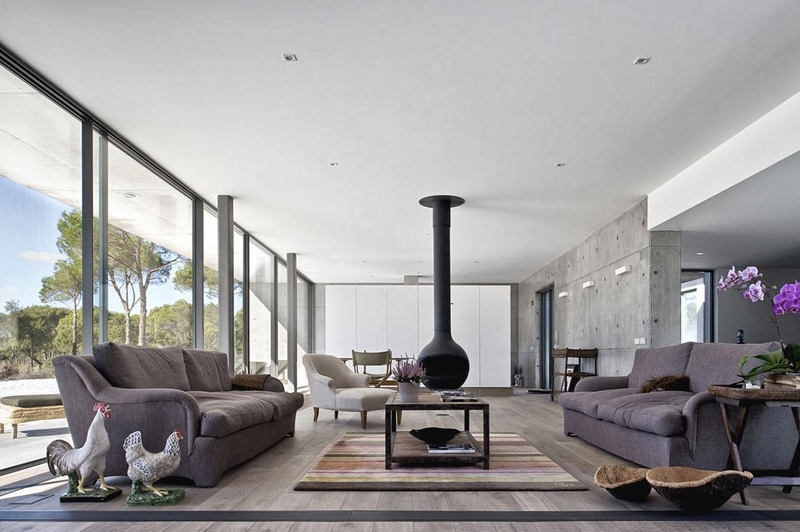 The volume that links them is clad in cement and wood fiber panels, with a fairly neutral expression. 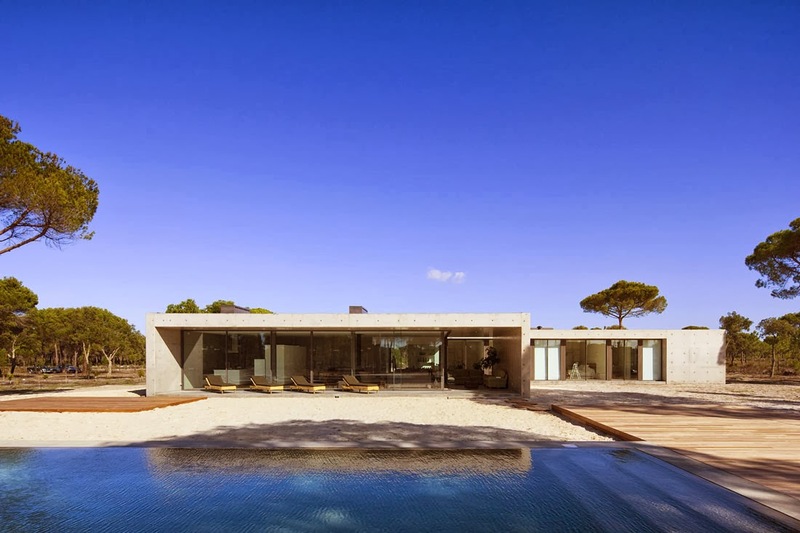 A major concern in the design of the project was sun protection, an intention to make the house as permeable as possible, to merge the interior and exterior spaces, which led to large glazed planes necessarily protected from sunlight. So all glass planes are recessed and have shade screens. 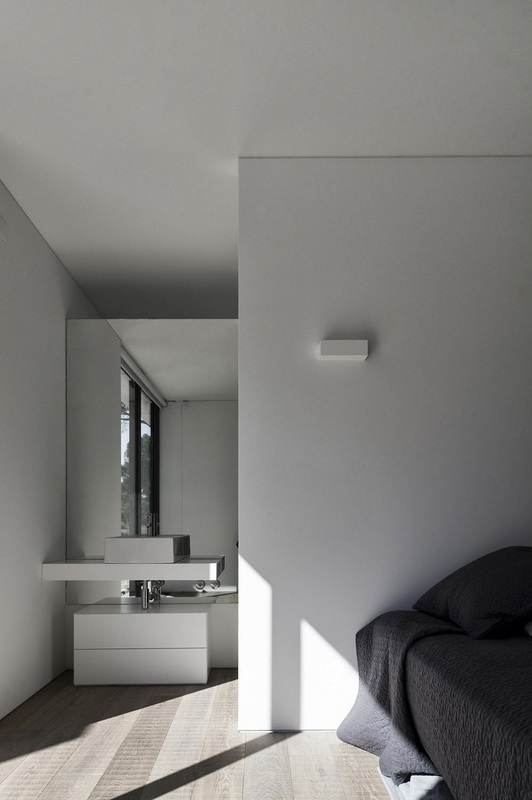 The interiors tend to follow the same line of consistency, highlighting a pure, stripped environment where transparencies and noble materials predominate. 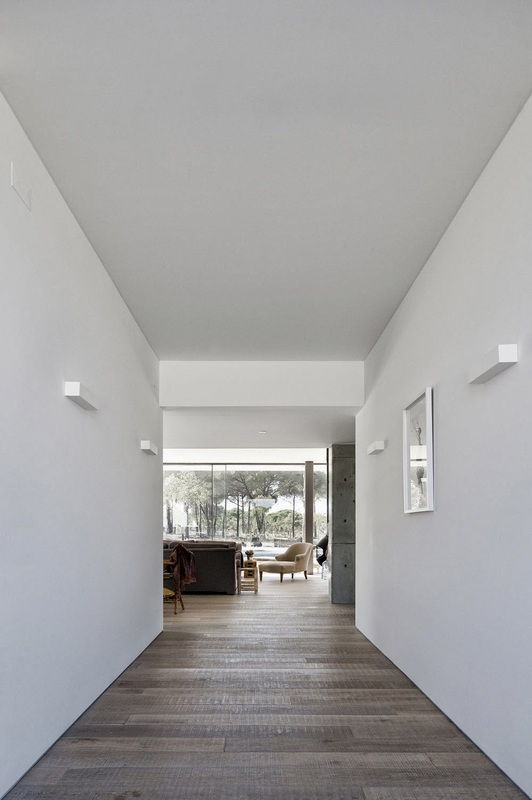 Whites planes are valued, covering almost all the interiors, on a natural wood pavement. 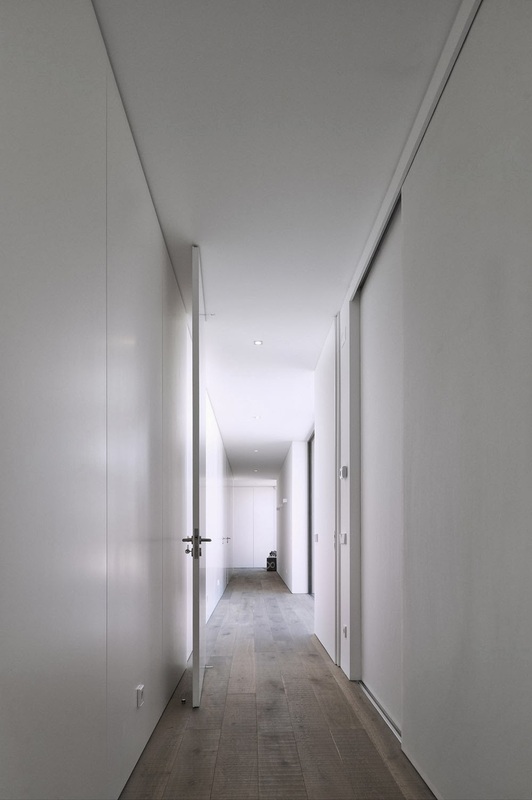 Following the philosophy of RRJ Architects, the building responds to the characteristics of the site, the starting point for the creation of unique designs.